Creative director leaving while the game is still in development is rather unusual, right? This looks to me like better news from Blizzard than worse from CDPR. The move from Poland to California might have been a bit of a shock. Not really unusual, if they are in Beta and are mostly polishing the game, he has nothing really to do. But that,s only one possibility. This looks rather unusual indeed. Unless Cyberpunk is much later in development than we imagined. Working on the same game for years would make you seriously bored. It's likely that by this point they're done with most of the story and narrative and are just building a lot of the remaining stuff to have it in a properly releasable state. If its this, then agreed. Maybe we will learn more in time? Good news for Blizzard though, quite the acquisition. Yup, my thoughts as well. This is pretty common. Quitting before the game ships is worrying. People make career/job changes all the time. perhaps his work on CyberPunk is done. Clearly this means doom and gloom. Nothing else can be inferred by this! Must have been his dream job. Another sign this game is very far along. This is normal, once the job is done you get your paycheck and move on. Not this far into development. Seems he actually wasn't the current Creative Director and was 'demoted' to Narrative/Setting Director, so probably not a huge deal. Well, I feel like it’s a bit odd he didn’t want to see the game he directed for 6 years to ship. There is probably very few creative director roles available on good companies so it is best to go there if you get an offer before someone else does. Game is done, probably stealth release on 1st Feb 2019. He was both according to his profile. He had multiple roles. Uhh, I’m going to disagree with the majority of this thread and say it’s not normal for the creative director to leave mid-flight. It would be like the director of a movie leaving after shooting is done and not overseeing any of the editing. Do people actually know that its common for games creative directors to leave like 12 months before release or whatever? Call BS that they do. Cos most big creative directors give interviews on the games release. Diablo to adopt the first-person perspective. I've seen it happen on all the games I've worked on personally. Is it a common thing? I couldn't tell. But it does happen. You don't remember the Diablo 3 color debacle don't you ? Stepien is very talented, to see him go where talented developers go to creatively die is super depressing. I fully expect him to come back in few years after having released nothing of note at Blizzard, Leon Boyarsky-style. Blizzard probably pays 3x as much or similar. What his experience brings to Blizzard though I have no idea. They don't make narrative focused games which he has worked on thus far. What a loss for CDPR. Interesting pick-up from Blizzard - they must have given him a lot of freedom. I imagine their talent is highly sought after and stands to get a huge paybump from other big AAA publishers. Maybe he can save WoW from dying. Creative director? Is this guy stepping into Metzen's shoes? Changing of the guard, though. People leaving blizzard means there are spots to fill. People were expressing concern because some of that guard is very very old, and had kept a relatively reliable hand at the rudder for lo these past 20 years. This is good news hopefully. A great creative person going INTO Blizzard hopefully means more well developed new games and content is on the stove for Blizzard. 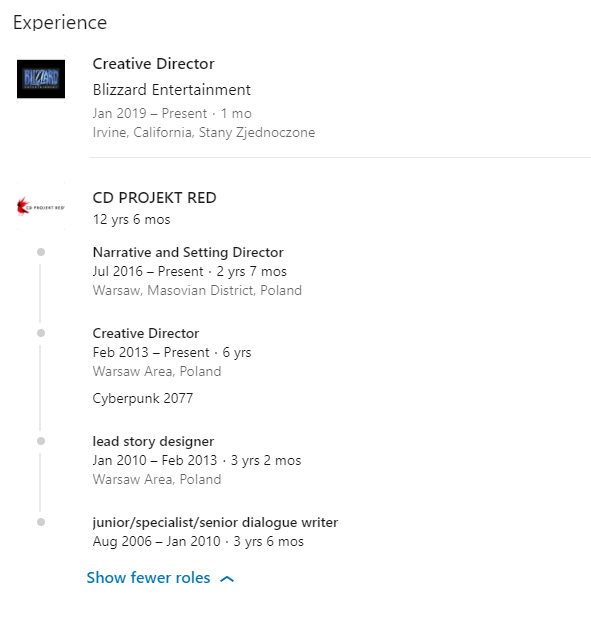 Also this likely means CDPR is far into Cyberpunk development that the Director of Creative development is no longer a vital role as one might worry when seeing such a high level member of the team leaving... let's also not forget how many people are working on this new CDPR game... losing one person to another super high profile developer isn't gonna spell doom for the project they're leaving behind. They probably offered him a ton of money. Hopefully his clout can keep the marketing people off his back long enough to make a good Blizzard game. While this is interesting, this Linkedin snooping is kinda creepy. Activision-Blizzard with those moves after letting Bungie go. I'm expecting a new IP with him involved. Hopefully it's just a sign that the writing and creative design is mostly resolved. Didn't they hint at a 2019 release date last year or was that just my brain mis-remembering? I just asked my friend from CDPR and he told me that the board was surprised by his leaving. He didn't accept the big pay rise they have offered him. That new director is moving on because he is getting a new FAT paycheck. I am confident the pay scale is much higher at blizzard. I wouldn’t look too deeply into cyberpunk losing him. People leave jobs all the time for various reasons. MONEY is a powerful motivator. Maybe he's excited for the opportunity to live and work in California? Yep. Although I suspect that CDPR is particularly susceptible to poaching due to the massive differences in salary and bonuses. For the reasons of him leaving, I could see the CDPR crunch finally taking too much of a toll. As to my understanding, Activision-Blizzard is allegedly really nice place to work. Atleast as far as gaming companies go, even though they had that one notable racial abuse and discrimination incident. Of course it won't be a vacation at Blizzard either, but likely bit more lax. Many of their games do have a lot of story and especially lore. It's just that it's not usually anything special.